Sony's Xperia NXP range has been around for a year now, and although it has been pretty successful, there have been some criticisms that Sony have lacked a truly high-end handset in their range. Sony have responded to this by producing the powerful, big screen Sony Xperia Z, a multimedia monster that looks certain to attract the right kind of attention. 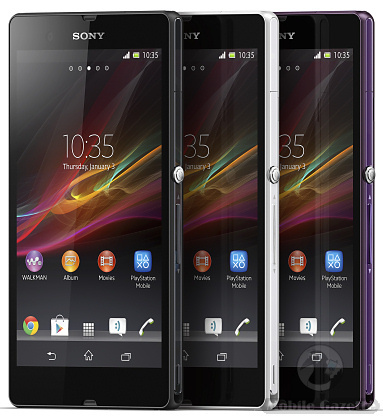 The Xperia Z is a big slab of a phone available in black, white or purple colour schemes. On the front is a very large 5" 1920 x 1080 pixel full HD display, enhanced with Sony's BRAVIA technology with a scratch-resistant coating. There's also a 2.1 megapixel front-facing camera, capable of 1080p HD video recording, but the impressive one is on the back - a 13 megapixel camera with an Exmor RS sensor and also 1080p HD video recording with High Dynamic Range support lifted straight from Sony's digital camcorder range. There's a LED flash plus a whole load of imaging enhancements that make the Xperia Z look like a very interesting digital imaging platform. Inside is a 1.5GHz quad core Qualcomm processor coupled with a very useful 2GB of RAM and 16GB of flash storage, expandable with a microSD card. There's a relatively large 2330 mAh battery which Sony says gives up to 14 hours talktime and 22 days standby time, and the whole Xperia Z package measures 139 x 71 x 7.9mm and weighs 146 grams. One unusual feature of the Xperia Z is that it is dust and water resistant to IP55 and IP57 standards, and it can even survive being immersed in water for up to 30 minutes (assuming all the ports are closed). Another unusual enhancement is STAMINA mode, which can improve the battery life through more aggressive application management when the display is off. Something that Sony has and most rivals don't is a massive library of multimedia content. Movies and music can be downloaded directly from Sony, and of course the Xperia Z has the usual WALKMAN enhancements. It can also interact with certain other Sony devices through the Xperia Z's built-in NFC capabilities, although getting the very best experience might involve going out and buying a more up-to-date Sony TV. On top of this, the Xperia Z has an FM radio plus of course all the multimedia capabilities of any other modern Android phone, including DLNA support. Out of the box, the Xperia Z will run Android 4.1 with an upgrade to 4.2 promised. The Xperia Z supports WiFi, Bluetooth 4.0, GPS plus GLONASS positioning systems and HDMI output via an MHL port. The only significant feature that seems to be missing is wireless charging. There will also be an Xperia ZL variant which offers similar features, but will be a bit more compact when it comes to size. 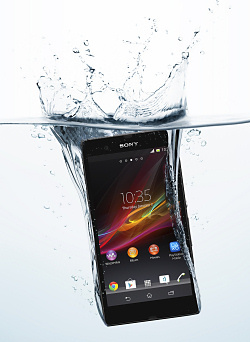 We don't know if the Xperia ZL is waterproof though. The Xperia Z is LTE capable, and will also support HSPA+ which means that you should be able to get some sort of high-speed connection on most carriers. Sony say that the Xperia Z should be available during Q1 2013, with Phones4U in the UK saying that it will be available from 1st March. 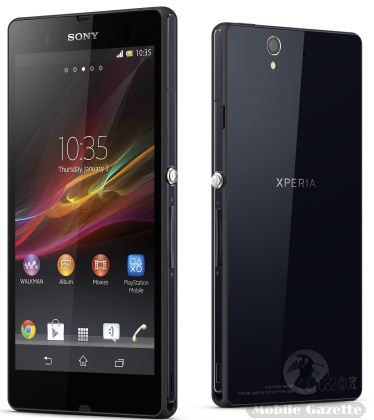 No guidance was given on price, but we would expect the Xperia Z to retail for about €500 when it hits the market.